Liv Loyal Rewards are our way of saying Thank You! Liv Goodyear is all about the people who call it home and make it a genuine community. 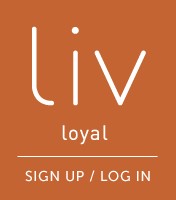 Liv Loyal gives us a chance to reward you for loving Liv. Start earning valuable points redeemable for thousands of brands from national retailers! • Earn points like cash for Living, like no other! Ask a team member how points are earned! • Gift codes can be used as gifts to family and friends. Thank you for being an important part of our Liv community. * Program retailers and terms are subject to change.